Myrtle rust (Puccinia psidii) is a fungal disease which infects plants in the Myrtaceae family. Common Australian Myrtaceae species include eucalyptus, willow myrtle, turpentine, bottlebrush, paperbark, tea tree and lilly pilly. Since myrtle rust was first detected in NSW in April 2010 it has spread across the eastern Australian landscape in bushland reserves, home gardens, commercial operations and amenity settings such as parks and street plantings. Myrtle rust can now be found in New South Wales, Victoria, Queensland, Tasmania and on the Tiwi Islands in the Northern Territory. 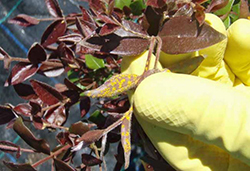 When myrtle rust was first detected, a response was initiated to eradicate myrtle rust. The response was unsuccessful because myrtle rust spores are very easily dispersed by wind. In December 2010 eradication efforts were abandoned and transitioned to management. Precautions to limit the spread of myrtle rust should be taken by people carrying out activities where there is potential to spread myrtle rust to vulnerable species or plant communities. Will my actions spread myrtle rust to new areas? Will my actions spread myrtle rust to a vulnerable and important plant species or plant community? What can I do and how can I change my actions so that I do not spread myrtle rust? Myrtle rust is a fungal disease which attacks soft, actively growing leaves, shoot tips and young stems. Severity of infection and symptoms vary with different host species. Myrtle rust may also attack flowers and fruit of certain hosts. Generally myrtle rust starts as small purple spots on leaves. Bright yellow spores form in pustules within these purple spots. Pustules fade to dull yellow and then grey as the infection ages. In severe infections, spots enlarge and merge, often causing leaf distortion. Heavy infection can result in the death of soft plant material. Whole plant death may occur in highly susceptible hosts. Plants with dark purple leaves such as willow myrtle 'Afterdark' (Agonis flexuosa cv 'Afterdark') do not display obvious symptoms of early infection. Disease becomes apparent once the bright yellow pustules form on both surfaces of the infected leaf. 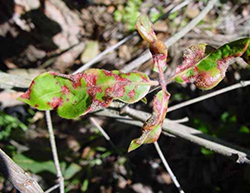 On turpentine (Syncarpia glomulifera), initial symptoms appear as small purple flecks on young leaves then yellow pustules form on the lower surface. The visible yellow pustules of myrtle rust are made up of millions of powdery yellow spores. Spores are spread by wind to other host plants. Spores germinate and the myrtle rust fungus grows, piercing plant cells to obtain nutrients from the plant. Myrtle rust spores require darkness, moisture and temperatures of 15–25°C to germinate. The first symptoms become visible within 3−5 days of initial infection. The new pustules can mature to release spores in 10–12 days. Spores can remain viable for up to three months. Myrtle rust spreads naturally by wind, water, insects and animals. Spread can occur rapidly. Rust spores can travel very long distances and may infect susceptible plants many kilometres from the initial site of infection. Myrtle rust spores can also spread over long distances if carried on infected plant material, contaminated equipment, vehicles and clothing. Myrtle rust infects plants in the family Myrtaceae. New host species in Australia are continuously being discovered. To date, over 300 hosts have been recorded and can be found in the Australian Network for Plant Conservation host list. The plant family Myrtaceae dominates many major Australian ecosystems. The short term impact of myrtle rust on mature trees is minimal. Continued infection of new seedlings and young trees over time may hinder the regeneration of susceptible species in natural forests. This may alter species balance and modify currently stable environments. Genetic diversity in highly susceptible species could be greatly reduced and the structure and function of certain ecosystems could be adversely affected in the long term. Myrtle rust is a problem for commercial operations such as timber plantations and nurseries. Myrtle rust can lead to seedling death and increases costs of managing disease outbreaks. The movement of Myrtaceae plant material is regulated in some states and trade can be impacted. At the time of writing Tasmania, Western Australia, Northern Territory and South Australia have quarantine restrictions in place for the importation of products of the Myrtaceae family from states known to have myrtle rust. Myrtle rust is widespread along the east coast of Australia from southern New South Wales to far north Queensland. In Victoria myrtle rust is found mainly in production nurseries around Melbourne. In Tasmania myrtle rust is found on properties on the north-west coast. Myrtle rust has been found on the Tiwi Islands off the coast of the Northern Territory. Favourable conditions for the continued spread of myrtle rust include all coastal areas of Australia and inland areas with required humidity levels and susceptible hosts. Myrtle rust is unlikely to establish in arid regions as dry conditions do not support disease growth and spread. There are a number of fungicides available for the control of myrtle rust. Consult your local garden centre for a list of approved products. Highly susceptible host plants are likely to become reinfected unless regularly treated. Rotation of fungicides containing different active ingredients is recommended to ensure fungicide applications remain effective. An Interstate Certification Assurance (ICA) arrangement, ICA-42 (PDF, 373.59 KB) Production Nursery freedom, treatment and inspection for myrtle rust is in place to assist businesses trading in myrtle rust host plants to comply with interstate quarantine requirements.As market access requirements may be subject to change, the requirements for all States and Territories should be checked prior to export. Please visit the ICA website for further information.